360 pages | 90 B/W Illus. To adequately protect an organization, physical security must go beyond the "gates, guns, and guards" mentality that characterizes most security programs. Creating a sound security plan involves understanding not only security requirements but also the dynamics of the marketplace, employee issues, and management goals. The Complete Guide to Physical Security discusses the assets of a facility—people, building, and location—and the various means to protect them. It emphasizes the marriage of technology and physical hardware to help those tasked with protecting these assets to operate successfully in the ever-changing world of security. 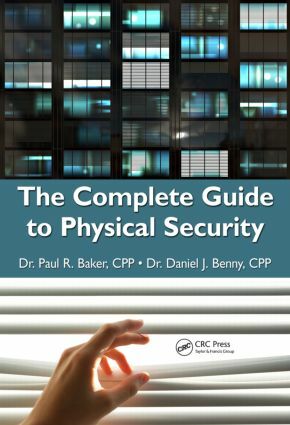 "There is much to like about this book with its definitions as well as the logical progression through the chapters on how to develop a physical security program … it is a good introduction to physical security concepts." What Should Your Security Philosophies Be? Dr. Baker is board certified in security management as a certified protection professional (CPP) by ASIS (American Society for Industrial Security) International. He is an adjunct professor for University of Maryland University College in the homeland security field and an adjunct professor for Southwestern College in its security management curriculum. He is a contributor to the CRC Press books Official (ISC)2® Guide to the CISSP® CBK®, Second Edition and Official (ISC)2 Guide to the ISSAP CBK. Dr. Daniel J. Benny is the security discipline chair at Embry-Riddle Aeronautical University. He served as a U.S. Navy intelligence officer and DOD Federal Police Chief and holds a Ph.D. in Criminal Justice from Capella University. He is board-certified in security management as a certified protection professional (CPP) and board-certified as a professional certified investigator (PCI)—both by ASIS International; certified fraud examiner (CFE) by the Association of Certified Fraud Examiners; certified confidentiality officer (CCO) by the Business Espionage Controls and Countermeasures Association; certified member (CM) airport certified employee-security (ACE); and airport security coordinator by the American Association of Airport Executives. Dr. Benny is the author of the CRC Press books General Aviation Security: Aircraft, Hangars, Fixed-Base Operations, Flight Schools, and Airports; Cultural Property Security: Protecting Museums, Historic Sites, Archives, and Libraries; and the forthcoming book, Industrial Espionage: Developing a Counterespionage Program Security. He has authored over 300 articles on security administration, intelligence, aviation security, private investigation, and cultural property security topics.